At least 13 Afghan police and civilians have died in two incidents involving international forces, officials say. Four Afghan police and five civilians died in an apparently mistaken air strike by international coalition forces in Farah province. Separately, the Nato-led Isaf said it had "accidentally" killed at least four civilians in Paktika province. The incidents are the latest in a series of controversial clashes involving foreign troops. They come as US Democratic presidential candidate Barack Obama is in Afghanistan as part of an overseas tour. Mr Obama, who wants to increase US troop levels in Afghanistan, was due to meet Afghan President Hamid Karzai on Sunday. Mr Karzai has said no civilian casualty is acceptable. The BBC's Martin Patience, in Kabul, says there was darkness and much confusion when the Farah province fighting took place in the early hours of Sunday morning. 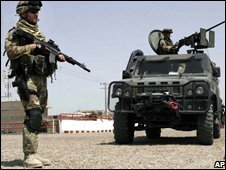 The police had opened fire on a joint convoy of Afghan national army and foreign troops believing - incorrectly - that they were Taleban fighters. The deputy governor of Farah province, Younus Rasuli, said the foreign troops had not informed police they were coming. On hearing the gunfire, a number of locals had rushed to support the police, our correspondent says. Nato and US coalition officials are investigating the reports. In Paktika province, Isaf said at least four and possibly as many as seven civilians had been killed when one of its units fired two mortar rounds which landed about 1km from their intended target. "ISAF deeply regrets this accident, and an investigation as to the exact circumstances of this tragic event is now underway," it said in a statement. The issue of civilian casualties at the hands of foreign forces is a hugely sensitive issue in Afghanistan. In the past, the Afghan President Hamid Karzai has said that no civilian casualty is acceptable. Last week, local tribal elders claimed dozens of people, including civilians, died in a Nato-led attack in Herat province, though Nato strongly denied this. Earlier US forces admitted killing eight civilians in Farah province after they were attacked in Bakwa district. And on 6 July, more than 50 people from an Afghan wedding party were said to have been killed after being bombed by US aircraft in the eastern province of Nangarhar.